The next small grant deadline (grant requests for $10,000 or less) for the Minnesota Historical & Cultural Heritage Grants program will be Friday April 11, 2014. Questions? Contact the Grants Office. The exhibit explores the first one hundred years of Norwegian immigration in Minnesota and is a collaboration of RCHS and St. Paul Sons of Norway Synnove-Nordkap lodge. The travelling exhibit panels will be available for future installations in libraries, schools, and community centers. Lanesboro MN named one of America's 20 Best Small Towns. MNHS Historic Preservation Department takes a day for professional development. Studies find museums make people happier and less lonely. Good news from the Hmong Museum Initiative. Museum selfies: Is Museum Selfie Day genius, or just self-centered? Indianapolis Historic Preservation Commission, Indianapolis IN, seeks Preservation Planner. Deadline: April 5, 2014, 5 p.m. ET. Carver County Historical Society, Waconia MN, seeks half time Researcher. Email resume and cover letter with salary requirements. Deadline: April 25, 2014. Naperville Heritage Society/Naper Settlement, Naperville IL, seeks President and CEO. Deadline: May 15, 2014. Wisconsin Historical Museum, Madison WI, seeks Deputy Museum Director. Midwest Music Museum, Mall of America, Bloomington MN, has several current position openings. Blondo Consulting seeks Preservation Assistant. Email resumes to Steven Blondo. American Association for State and Local History launched a new Career Center on their website. Find jobs as well as career advice! Isanti County Historical Society, Cambridge MN, celebrates their grand opening with "Three Chicks and a Rooster," Saturday April 5, 2014, 6 p.m. Call 763-689-4229 for more information. Scott County Historical Society, Shakopee MN, offers a special tour just for kids of the Storied Treasures exhibit, Saturday April 5, 2014, 10:30 a.m. Free. Call 952-445-0378 for more information. Minnesota Discovery Center, Chisholm MN, hosts Teen Tinker Lab for kids ages 10 and up, Saturday April 5, 2014, 11 a.m. to 1 p.m. This session's theme is Mousetrap Race Cars. Contact Mai Vang, 218-254-1238, for more information. Isanti County Historical Society, Cambridge MN, hosts Representative Dean Urdahl, who will speak about the U.S.-Dakota War of 1862 and recent 150th Civil War commemorations, Sunday April 6, 2014, 2:30 p.m. Call 763-689-4229 for more information. Winona County Historical Society, Winona MN, hosts a Polish Egg Decorating class, April 8, 2014, 6-8 p.m. Space is limited; call 507-454-2723 x0 to register. White Bear Area Historical Society, White Bear Lake MN, will discuss White Bear's notorious gangsters, Tuesday April 8, 2014, 6:30 p.m., Wildwood Branch-Washington County Library, Mahtomedi. Call 651-407-5327 for more information. Stearns History Museum, St. Cloud MN, presents "The Rise and Fall of the Berlin Wall" with Erika Vora, Wednesday April 9, 2014, 9 a.m.
Minnesota Military Museum, Camp Ripley, Little Falls MN, honors volunteer service by providing free admission to their museum to any volunteer visiting the museum on Friday April 11, 2014. Volunteers must identify where they volunteer when they visit. Call 320-616-6050 for more information. Wadena County Historical Society, Wadena MN, hosts Representative Dean Urdahl, who will speak at the WCHS semi-annual meeting, Friday April 11, 2014, 7 p.m., Elks Lodge, Wadena. Free presentation; dinner available for purchase. Call 218-631-9079 for reservations. Northfield Historical Society, Northfield MN, hosts "Night of 10,000 Laughs," Friday April 11, 2014, Grand Event Center, 6:30 p.m. Advance ticket purchase is recommended. Carlton County Historical Society, Cloquet MN, celebrates their 65th anniversary at their Annual Meeting and Spaghetti Dinner, Saturday April 12, 2014, 4:30-6:30 p.m., Atkins Northland Funeral Home, Cloquet. Call 218-879-1938 for more information or to purchase tickets. Washington County Historical Society, Stillwater MN, will hold a new volunteer orientation/informational meeting at the Warden's House Museum, Saturday April 12, 2014, noon. Contact Sean Pallas, 651-439-5956, for more information. On Sunday, April 13, 2014, 3 p.m., hear pianist and clarinetist Butch Thompson in concert at the LeDuc Historic Estate, Hastings MN. Reservations must be made by calling 651-437-7055. Donation of $10 requested. Excelsior-Lake Minnetonka Historical Society, Excelsior MN, invites the public to their next Tapping History event, April 14, 2014, 7 p.m., at Jake O'Connor's, Excelsior. F. Todd Warner will speak about classic boats. Contact Dan Johnson, 612-805-2397, for more information. Scott County Historical Society, Shakopee MN, invites the public to discover the beautiful art of paper cutting with local artist Judy Case, Thursday April 17, 2014, 7-8 p.m. Cost: $5/person. Contact Stephanie for more information. St. Louis County Historical Society, Duluth MN, hosts Gina Temple-Rhodes, proprietor of Cedar Story Services, at the next "Lunch with the History People" event, Thursday April 17, 2014, noon. Call 218-733-7568 for more information. Carver County Historical Society, Waconia MN, hosts Tea Lady Kris James, who will lead a tea tasting, complete with the history of tea, teapots, and tea ceremonies, Saturday April 19, 2014, 2 p.m. Cost: $5/person. Adults only. Space is limited; call 952-442-4234 to register. Waseca County Historical Society, Waseca MN, presents their second Spring Luncheon Lecture Series with Elizabeth Dorsey Hatle, author of "The Ku Klux Klan in Minnesota," noon, April 24, 2014. Cost: $12/members; $16/nonmembers. Call 507-835-7700 for reservation; payment due by April 22. Mower County Historical Society, Austin MN, hosts Marvin B. Eppard, who will speak on his new book "A Heritage Not Forgotten" at the next Lunch Box History Series program, April 24, 2014, noon, Pioneer Building. Historical and Cultural Society of Clay County, Moorhead MN, will host musician Lauren Pelon for a concert at the Hjemkomst Center, Moorhead, Thursday April 24, 2014, 7 p.m. Learn some world music history! Tickets: $10/adults; $7/students. Call 218-299-5511 for more information. Ramsey County Library-White Bear Lake hosts White Bear Lake Area Historical Society and genealogist Tom Rice, who will discuss methods of organizing genealogical data, Thursday April 24, 2014, 2 p.m. call 651-407-5327 for more information. Ramsey County Library-White Bear Lake hosts White Bear Lake Area Historical Society, who will hold a discussion on the history of the White Bear Library, Monday April 28, 2014, 6 p.m. Call 651-407-5327 for more information. Schroeder Area Historical Society, Schroeder MN, offers the rare opportunity to see historic cabins designed by Edwin Lundie, July 12, 2014. Call 218-663-7706 for information and reservations. Space is limited. Minnesota Council of Nonprofits hosts "Fundamentals of Nonprofit Finance," April 15, 2014, 9 a.m. to noon, Wilder Center, St. Paul MN. Register online. Connecting to Collections Online Community hosts "The Supercharged Management System: Implementing the Incident Command System in Cultural Repositories," Thursday April 17, 2014, 1 p.m. ET. Minnesota Council of Nonprofits hosts "Creating a Nonprofit Business Plan," April 24, 2014, 1:30 to 4 p.m., MCN Conference Room. Hennepin County Library, Minneapolis MN, announces that they have added six more years of the Minneapolis City Directories to their digital collections: 1865 and 1918-1922. The collection is now a complete run from 1859-1922. Directories are searchable, browsable, and freely available. Dakota County Historical Society, South St. Paul MN, offers 109 issues of the "Journal of American History," 1970-1999. Free. Call Rebecca, 651-552-7548. Blandin Foundation offers several Blandin Community Broadband Programs. Deadlines: April 4 and June 13, 2014. Minnesota State Arts Board offers several grants for arts programs and artists. Elmer L. & Eleanor J. Andersen Foundation offers Legacy Grants for various programs. Deadline: May 1, 2014. Addressing museum facilities does not automatically mean building a new building or an addition. Sometimes greater efficiency can be gained through re-working the existing facility to meet modern needs and practices. Reconsidering space use not only can capture under-utilized volumetric space, but doing so is often the least costly way to achieve your space goals. Kudos to the Jackson County Historical Society, Lakefield MN, for taking a hard look and now re-working its space. 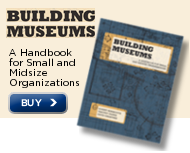 For more ideas on getting the facility you need, see the book Building Museums: a handbook for small and midsize organizations. Scholarships are available to the 2014 AASLH Conference, St. Paul MN. Deadline: April 11, or June 13, 2014. Annual Spring Local History Workshops Return! These one-day workshops held at convenient locations around the state offer practical information about best practices on a variety of topics. Curiosity's Cats: Writers on Research, edited by Bruce Joshua Miller. New from Minnesota Historical Society Press.